Working from home means I need to keep my environment as inspiring and tidy as possible. The state of my surroundings really affects my productivity so the first thing I do every morning is make my bed. The task has become such an essential part of my morning routine that it’s almost like brushing my teeth. And over the course of time I’ve found that the more you like your bedding, the more excited you are to make your bed all pretty for the day. 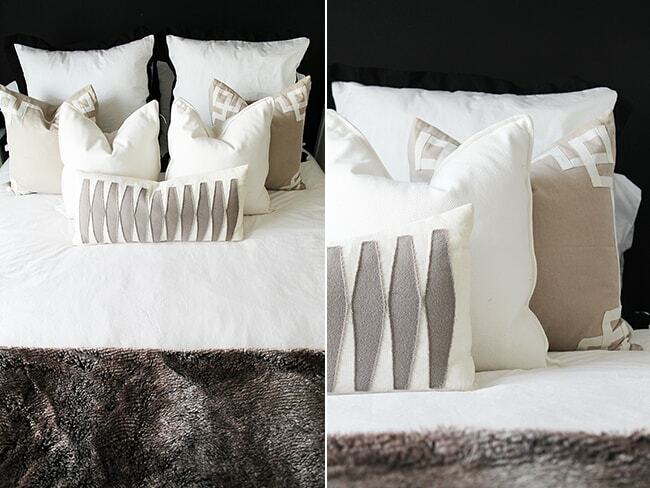 Are you ready switch things up with your bedding? 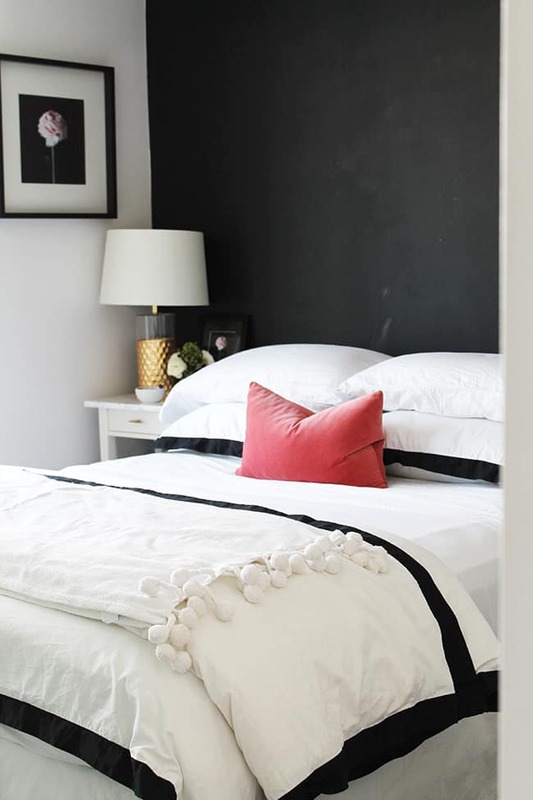 I’m going to show you 3 different ways to style your bed. And starting with a great duvet really makes a difference. It’s like having a great rug: it grounds your space and ties everything together. A solid duvet cover (whites are my favorite!) is the most versatile. 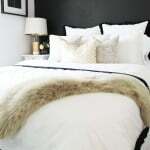 I’ve been loving my Crane & Canopy duvet cover since the day I got it, especially the bold black border which I think adds a bit of sophistication. 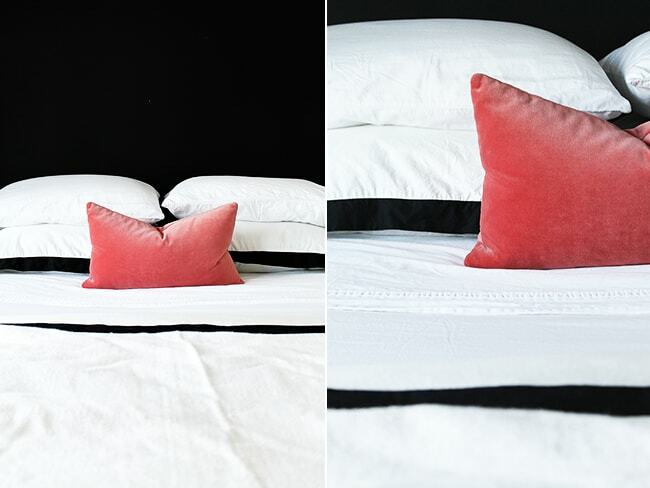 With a solid color duvet, you can update your bed’s whole look with pillow covers or a throw. Add floral pillows to keep things light in spring and incorporate cozy fabrics in winter. White, black and gold create a simple but sophisticated color scheme. Use a 3-2-1 pillow configuration (can you tell I like pillows?) on a folded duvet and place European shams at the back to a fake a headboard. 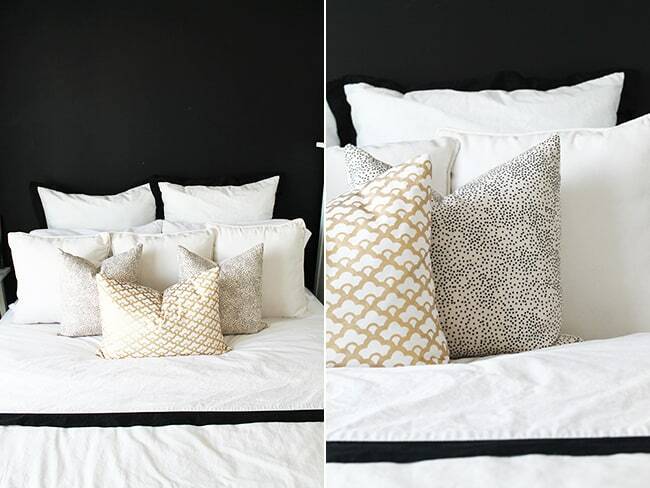 Place the shams and pillows horizontally to keep it minimal with just one bright lumbar pillow. This time I brought the duvet all the way to the footer, folding it three times and placing a throw on top for some added texture. If you have a guest room (or want to make something special), this configuration is a great way to treat guests as you could place a little flower stem or chocolate on top of the pillow as a nice gesture. 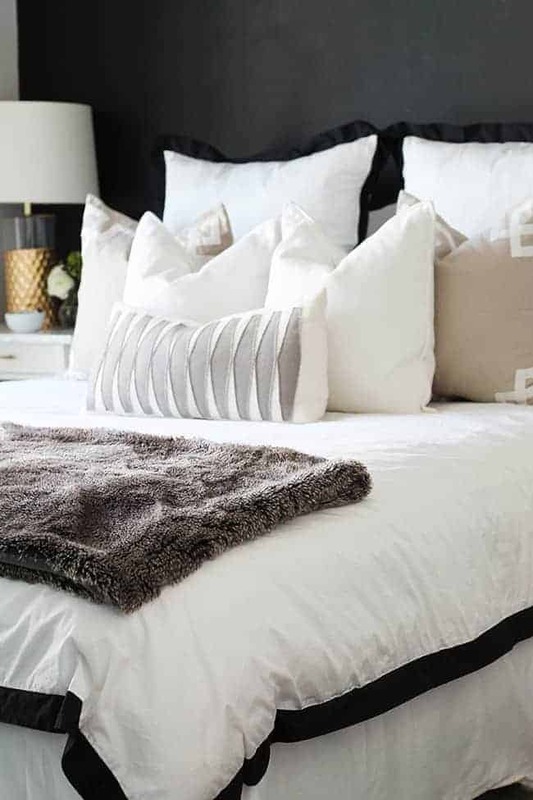 Keep the colors neutral and add interest and texture to the bed with a soft faux fur throw. Here I didn't fold the duvet and I placed the pillows at the back, followed by the shams and a 2-2-1 pillow configuration. Thank you to Crane & Canopy for providing bedding for this post. Haha! Ladies… At least you can get your man out of bed to MAKE it!! *teasing of course* I wake up much earlier than my husband, so all of my productivity goes into everywhere else and by the time he’s up, I’ve done so much I hardly feel like making my bed. I need to get into a better habit of this!! Great post by the way!! I absolutely love the tips – I really should invest in a great duvet. I feel like it would seriously motivate me to keep the bedroom neater if I had a great bed set. At the moment, I’m using a “missionary” style bed set my parents used to use. I’m redesigning my whole house to be more of an eclectic cross between vintage-shabby-chic and modern-contemporary, so I should really hop on that…. Haha!! My biggest problem with styling our bed is the fact that my husband hates laying on all the pillows. So he’s decided to just throw them on the floor, and the dogs end up laying all over them. It’s given me a preview of why people don’t generally have nice things when they have kids. Sometimes the same could be said for when you get a husband. The most challenging part of styling my bed now is to style it with my boyfriend, who’s not a big fan of prints. 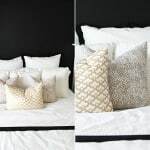 I like the solid white choice and then I can sneak in my feminine pillows!